Swimming is one of the most effective (and enjoyable!) ways to exercise your body and improve your fitness. Regular swimming has not only been proven to increase cardiovascular fitness and build muscle, but it will leave you feeling slimmer, stronger, more flexible, and less stressed. 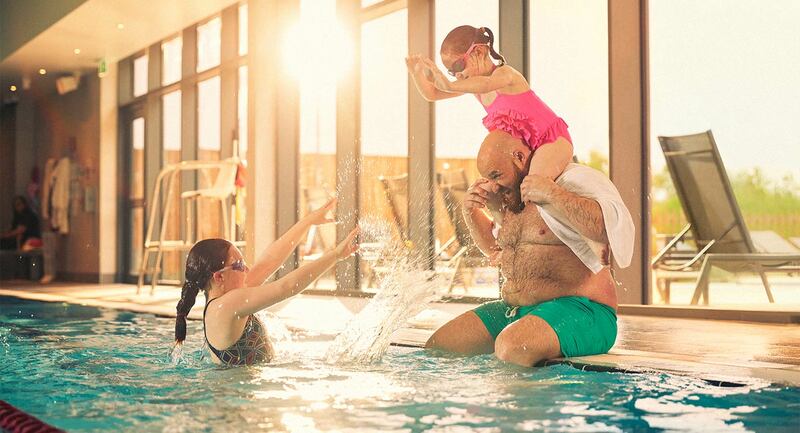 Here at David Lloyd Clubs we offer a wide range of facilities and services for the whole family. With both indoor and outdoor pools at the majority of our clubs, you can look forward to swimming all year round, regardless of the weather. Our pools are suitable for both intensive training and relaxing play-time for the kids. With special shallow, splash pools and trained lifeguards on constant watch, you can leave your kids to play with complete peace of mind. Once you’re out of the pool, relax in our state-of-the-art spas, complete with sauna, steam-room and whirlpools depending on your club. If you’re looking to take your child to the next level, then look no further. If they can swim 100 metres performing two of the four main strokes (swim stage 7), then it's the perfect time to join the swim team. Coaches will inspire and support them to improve their skills, stamina and confidence. See them shine at time trials and galas and dive into action at water polo. They’ll discover team work, meet new friends and find their competitive streak! Take the plunge and speak to a member of the swim team or book their assessment on the mobile app today. After you’ve finished in the pool, why not head to the spa to unwind after your workout and enjoy some much deserved ‘me’ time? You’ll find a sauna, steam room and whirlpools at the majority of our clubs, where you can escape the world and spend a few hours relaxing and rejuvenating. Soak sore and tired muscles in a warm whirlpool, sweat out toxins and stress in a hot sauna, or just relax and breathe on one of our heated beds. Perfect for a post-swim relaxation session, or some quiet time while the kids enjoy their swimming lessons, our spas are all high-quality and built to provide you with a calming escape from the stresses of everyday life. One of the joys of swimming at David Lloyd Clubs is that we have the perfect pool for every season! Our heated indoor pools mean that you don’t have to put your training on hold over the winter months and can warm up anytime, whether you’re after a relaxing dip, an energising workout or some fun play-time with the little ones in the splash pool. During the warmer months, make the most of the sunny weather with our outdoor pools. Relax and cool down with a quick dip, enjoy an invigorating training session or sit back and relax on one of our sun loungers, soak up the rays and watch the kids play in the splash pool. With a series of different pools and a number of special adult only swim times as well as family swim times, you’ll find a time to enjoy our pools for whatever purpose or activity you like. Swimming is an incredible way to stay healthy and fit and we offer professional and fun swimming lessons and classes for all ages and levels. The benefits of swimming for children are well-documented, so it a good idea to ensure your child is comfortable and confident in the water from an early age. Here at David Lloyd Clubs, we offer a highly-accredited All Stars Swim programme. Endorsed by the Amateur Swimming Association and taught by our very own expert coaches, lessons are tailored to suit children of all ages and abilities. Classes are divided into stages and designed to suit your child’s ability - as they learn and improve they will move through the different levels. Our programme begins with basic skills, buoyancy and balance, before moving on to breaststroke, backstroke and butterfly. You can join your kids in the water when they’re just starting out (ages 18-36 months) and watch as they progress and grow in confidence. As an adult, whether you’re a seasoned swimmer looking to perfect your technique, or a total beginner in the water, our expert coaches can help you achieve your goals. Looking for individual attention and a focused programme? One-to-one lessons are the way to go. Keen on experiencing the community and fun of a swimming group? Join one of our coach-led swimming clubs, such as our Adult Swim Squad sessions, where you’ll get the guidance you need while making new friends. If you’re keen on trying something new and different in the pool, we offer a number of aqua classes. Fun and energising, these incorporate aerobic exercises while using the water as resistance for an extra push. Some classes make use of various buoyancy aids, while others simply rely on your body and the water. With a range of pools and a variety of swimming activities, you're certain to find something you love. Whether it's a fun family day out or an intense cardio workout, there's something to suit everyone at David Lloyd Clubs.